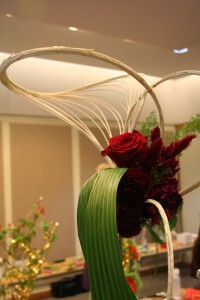 Many years ago I took a great course learning european floral design techniques at the AFS Education Center (now Teleflora) in Oklahoma City, OK. It was a great experience, and at the time it was suggested to me that I should study with one of the other designers who taught design classes there, and her name was Hitomi Gilliam. 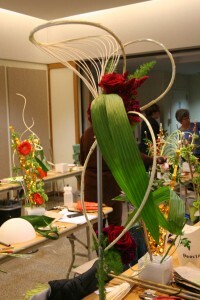 I knew her work, ikebana infused floral designs, and I kept thinking about it. Lots of years have passed since then and it just never happened. But I found myself drawn to her work once again this year, perhaps my desire to begin fusing my ikebana with my floral design work fueled that interest. So I began looking to see if I could find a demonstration or workshop close by to attend. Bingo! I found both a demonstration and a workshop, close by and each within one week. Hooray!!! So I signed up for both, hoping to gain some useful information and a lot of inspiration. As luck would have it, I got both. The demonstration at Potomac Floral Wholesale was geared toward wedding work, but there was lots of useful bits for everyday work as well. I took lots of handwritten notes as well many mental ones. 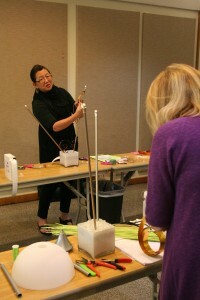 But what I really wanted was the hands-on workshop be held a week later thru the Innovative Floral Designers Association. 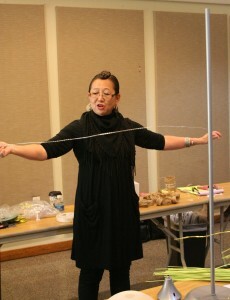 The workshop was great, Hitomi is a very enthusiastic, engaging teacher. It is wonderful take a workshop from someone obviously loves what they do and can’t wait to give you as much information as possible. During the morning session we began creating a spiral structure made with aluminum wire and midollino sticks, bound with boullion wire. My spiral was a bit tight ( think it is simply a matter of practice), but we were assured that no matter how tight or loose the spiral was that we could use it. 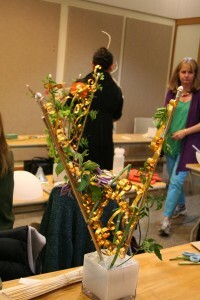 We attached the spiral to a stand made from using the pieces of a floor lamp provided to us, which opened my mind more to using every day items to create floral art. 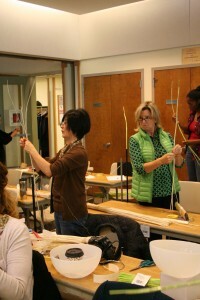 I think most of the participants felt the pressure of trying to learn a new weaving technique with limited time to create a usable piece to make a finished work later in the day. We finished our spiral structures and put them aside until later in the afternoon when we were to add flowers to complete them. 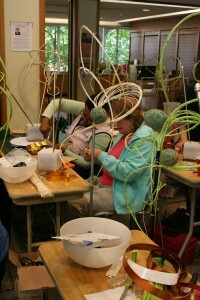 After lunch we worked on the second piece for the day, a wire armature screen for flowers. Using strips of flat wire (the wire we were given was too wide so we had to cut in half lengthwise) we made curls and pieces curled at both ends to form the screen. The base was a white glass cube with styrofoam at the bottom, then oasis on top of that just below the rim of the cube. A simple curtain rod, pulled apart to give us two pieces to use, was inserted into the foam to make a “V” shape. We connected the curls with Uglu tabs to build the screen and used boullion wire to further stabilize the screen. Then flowers were added and we had our floral screen design done. Sadly I got one bad photo of my final design. 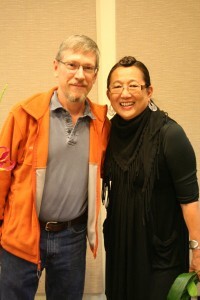 My priority was less on getting photos, and more on learning as much as I could. At least I had some record of my day. Later we began working on our designs using our midellino spiral forms. There was a good selection of flowers to use, and picked flowers in a similar tonal range of reds, burgundy and plum. As a during accent I used some whaleback palm using an interesting technique Hitomi taught us to give it some great curving movement and a few foxtail ferns and galax leaves. I loved what I created and the only adjustment to the design that Hitomi made was to change the direction of the foxtail ferns. The day was a great experience and I loved getting new ideas and techniques! I’ll leave you with a couple of added items, an interview with Hitomi at Floral Today and her YouTube tutorial on making the midollino spiral. Enjoy! Wow what a great post, your excitement came through clearly it was a long awaited experience that charged your imagination with some innovative new techniques. Mixing Ikebana and western floral design for commercial use is a very difficult challenge and it is great to see Hitomi Gilliam who can do it well.